When you have achieved a goal, what is the next step? Where do you go, and how exactly do you step up to the next level? Logically you would choose a goal, make a plan to get there, and execute that plan. I, of course, am talking about winter steelhead fishing. 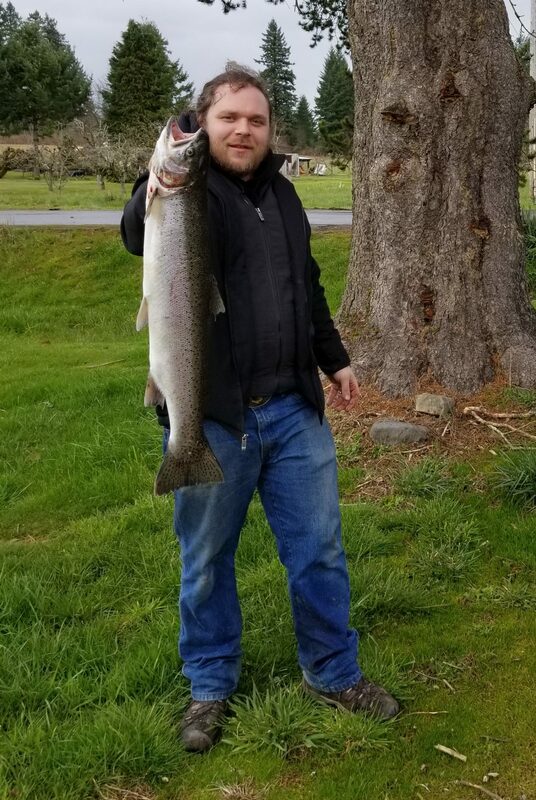 I got my first steelhead, so the next step was to choose a new goal and make it there right? Well, there are a lot of goals in that respect, and they certainly don’t form a uniform ladder with one goal leading you to the next. To evaluate my steelhead goals I had to look at what I wanted, and what I dreamed about at night. Since my only steelie was a hatchery fish I knew I wanted a wild one. I also wanted to bring home a limit, or have a day where I caught multiple fish. Of course every angler dreams about that once in a lifetime lunker, but for me, a steelhead over 10 pounds would be a very impressive catch. 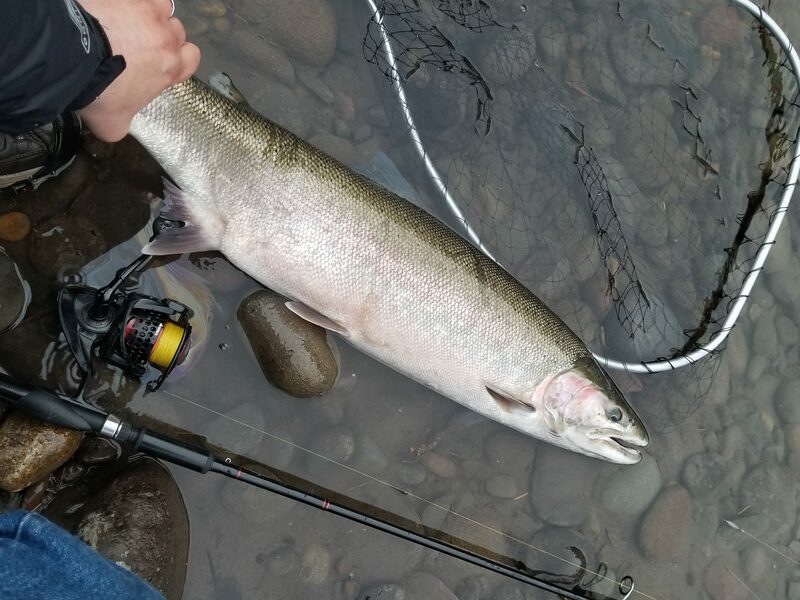 After the massive confidence boost from my first steelhead, a nice 8 lb hatchery buck I landed back in January, I felt ready to accomplish some more goals. I was ready to take on the world. I got up early everyday before work, and even sacrificed sleeping in on the weekends to try my luck at crossing some items off my list. One trip after another I gave it my best, but kept coming up short. 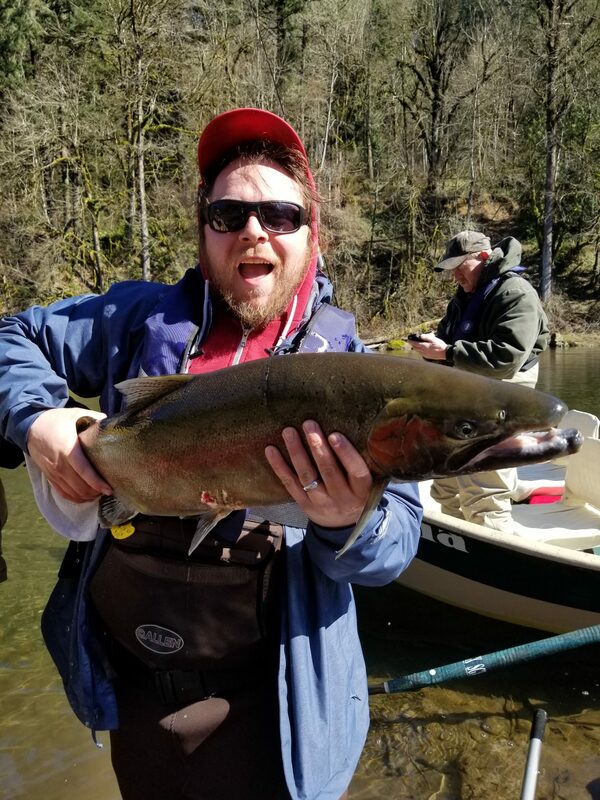 I wanted to fight another steelhead so bad, but through all of the rest of January, and all of February, no steelhead connected with my line. I was destroyed. 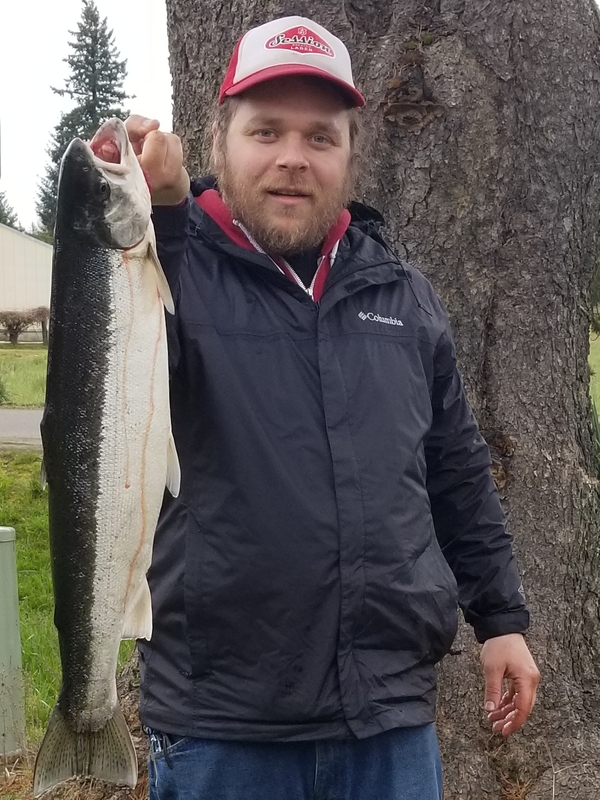 Despite my high hopes for my first winter steelhead season I didn’t even connect with a second fish. I was on the brink of giving up and taking some time off. At the beginning of March, I found out that I would be able to access a remote hole through a friend’s property. On my first trip out there, and on my first cast, my bobber stopped dead in it’s tracks. It didn’t go under, it just stopped. Naturally I assumed it was yet another snag in my long journey to more winter steelhead. I tugged on it and started to reel, there was resistance, and I saw a flash in the water. It was a bright steelhead, but I didn’t act quick enough to hook it. That was very disappointing, but at least it was something. For the rest of that day there were no signs of life. The next time I fished that hole, on my very first cast, my bobber went down again. I reeled in the slack and felt the tension, then that tug. The tug that keeps anglers coming back for more, the tug that becomes an obsession. I got a decent fight, and reeled in a nice native steelhead, probably about 6 pounds. It was my only fish that day, but to battle a native, and feel another fight was enough for me. There was another hole I had been fishing for a while before work everyday, and I was getting pretty tired of getting nothing out of it, so I decided to try a new spot. I gave it a good go drifting beads, floating jigs, and hucking metal, but nothing was working. I packed up my gear, and began walking out along the river. For whatever reason I decided to give it the proverbeal “one last cast” before I headed up the trail. It was a decision that paid dividends. I saw the bobber dunk under the water, reeled up, and I had another fight on my hands just a few days on the heels of my last one. This one was a hatchery fish that had been recycled back downstream. It was also my first fish ever taken on a jig. It weighed 7 pounds, had no eggs, and cut kind of mediocre. Still, it was a fun fight and gave me some meat for the smoker. A recycled hatchery hen I got on a jig. We set out early with hopes and confidence set very high. It was a beautiful morning, and I had some more experience under my belt this time. We drifted down the river at a leisurely pace, covering any spot Jeff though might hold fish. 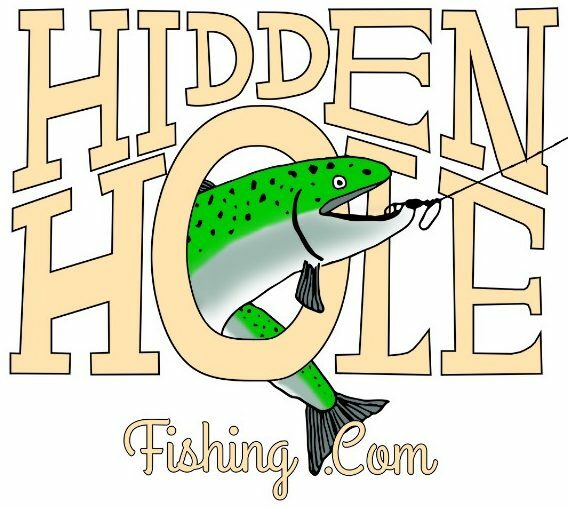 We were set up to use a number of different techniques, and had given them all a go by the time we made it to the hole where I had caught my last fish a couple days earlier. Jeff had us bobber doggin beads through the hole. About midway through the hole I had a bobber down. I reeled in and there was something on the other end, but it wasn’t putting up a great fight, so we assumed it was either a sucker fish or a smolt. As I got it closer to the boat, the rod bowed and line started peeling off the reel. That is when I knew it was a steelhead. I got it stopped and it ran some more just peeling line like it was nothing. I knew this was a big fish diving deep and taking line. I eventually got it turned and started getting it close to the boat. Once it was getting real close we caught ours first glimpse. It looked to be pretty big, but it was gone in a flash with the reel screaming as it took off downstream. Once I got it tired and close to the boat, we got the net ready. Everytime I had it within netting distance it took a dive, though it was still holding close enough to see. It was a monster. It took off a couple more times and didn’t want to come anywhere near the boat. Jeff decided to put the boat on the bank so he could get out and net the massive steelhead. I got the beast close to the stearn so it would make a dash downriver, and after a twenty minute battle it went right into the net Jeff had waiting for it. It was unbelievable, I was still shaking from the fight. This wasn’t just an accomplishment of one of my steelheading goals, it was a fish of a lifetime. Jeff estimated it to be around 21 pounds, and said it was probably the largest steelhead ever reeled in on his boat. It was a native buck, so we got some pictures and let it go. There were no more fish that day, but I had fulfilled one of my wildest dreams, so I was content. A ways down the river we ran into another guide, and he guessed it’s weight closer to 18 pounds. It was slightly disappointing having my 21 pound buck discounted to 18 pounds, but still a massive steelie anyway you look at it. 20 pound buck landed on a soft bead! The week following that made up for the countless days I spent getting skunked in January and February. I got a fish nearly everyday for the whole week. On monday I landed a beautiful 10 pound chrome bright native. It put on an amazing show jumping out of the water a great deal. It was also my first fish from floating a pink worm under a bobber. The next day I hooked into another fish using a pink worm. This one was hard fighting, taking lots of line off my reel. I chased it downstream, and it was another jumper. This was also a larger than average fish. It was quite a bit smaller than the monster from the previous weekend, but I had the presence of mind to get a weight and a length measurement. It was 16 pounds, 34 inches. Given the stats on this fish, I knew the other one had to be bigger than 18 pounds, and now feel pretty confident saying it was a twenty pounder. The next day I tried the worms again, and beads, but was having no luck. I wanted to try a jig, but had run out of time. I was packing up when I saw a jig with some leader that somebody had abandoned on the bank, and I took it as a sign. I tied it on and with the first cast on that jig I connected. It was a good fight from a native hen probably around 7 or 8 pounds. It wriggled away from me before I could snap a picture, but I got what I really wanted from it; the fight. My final fish that week came again after exhausting most of the techniques I had been successful with. Again, I was ready to leave when I decided to try hucking a spoon, something I had not been successful with yet. On my second cast I hooked another jumper. 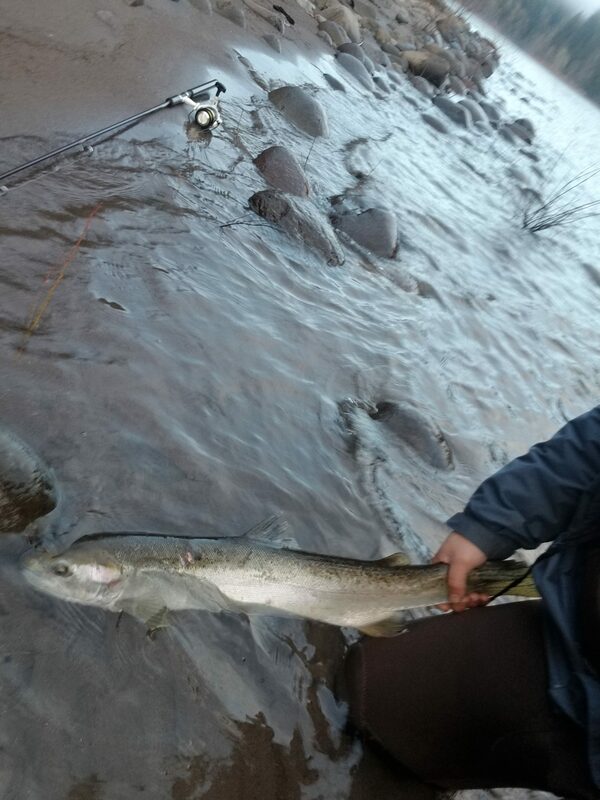 It was a beautiful, bright, and fresh hatchery steelhead, 7 pounds. It gave me a lot of eggs and, some excellent meat to put on the table. Since that span of about a week and a half things have slowed down considerably. I hooked into another chrome bright fish but it shook the hook a few feet from the bank. All in all though, I would say I had a phenomenal first season really targeting steelhead. I have landed 8 fish so far, 3 of which I’ve been able to put on my tag. I landed fish using nearly every technique I know, and really cut my teeth gaining a ton of experience. Not to mention the fact that I accomplished a feat that some anglers spend their whole careers perusing; a 20 pounder. I know I have a lot to learn and many more fish to catch, as well as some more goals to check off my list. Hopefully I can catch my limit sometime or perhaps someday I can catch a record breaker. Until then I’ll keep my eyes starry, but for now, I’ll be dreaming about Springers.